The Charleston Harbor is home to the country’s most intriguing Civil War naval battle. Yes, I’m talking about the one and only HL Hunley, also called “The Diver”, “The Infernal Machine”, “The Fish Boat”, “The Peripatetic Coffin”. The Hunley was the world’s first combat submarine to successfully sink an enemy ship, and recently, I got a chance to see it. submarines replicas, and viewing of the Natl Geographic “Raising the Hunley” documentary. Like Lt. George Dixon’s watch, that when opened had the hands still in position!…or crewmen brain tissue inside the skulls, soft tissue in the shoes, and most amazing discovery of all… fingerprints! For more than a century a romantic legend has captured the hearts and minds of countless Civil War history buffs: the story of the lucky $20 gold coin that saved the life of Lt. George Dixon, the captain who lead HL Hunley in its final mission. It was believed, his sweetheart, Queenie Bennet gave Dixon a 1860-minted gold coin as a good luck charm. And the coin delivered! During the 1862 Battle of Shiloh, he was shot point blank. A bullet ripped into the pocket of his trousers and struck the center of the coin. The impact was said to have left the gold piece bent, with the bullet embedded in it. 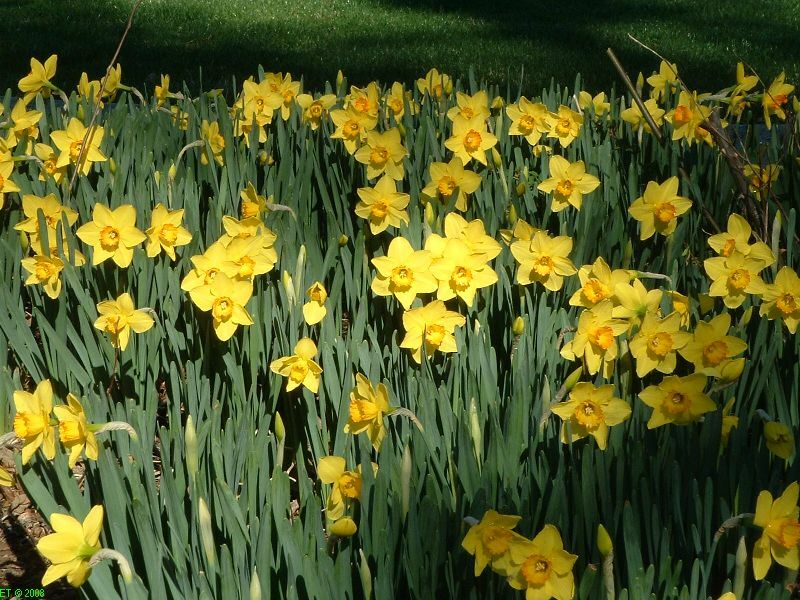 Was the legend true or merely a romantic tale? The world got the answer 137 years later. In 2000, during the excavation of the H.L. 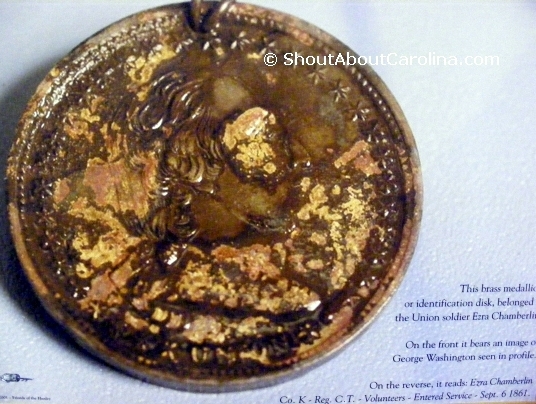 Hunley, the gold coin was discovered next to the remains of Lt. George Dixon. It was deeply indented and carried traces of lead! 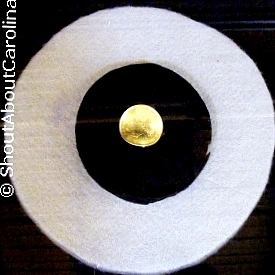 The above photo is from the coin replica displayed inside the HL Hunley Museum. It was cast from the original. Now, for $10, you can purchase a similar gold coin replica from the Friends of the Hunley online store. Dixon’s gold and diamond ring and brooch…another charm, another love story? Exquisite diamond gold jewelry on a Civil War secret mission? • A 18-24 carat gold ring with 9 large diamonds It has no inscriptions or jewelry marks and resembles a ring for a rich and more mature woman. 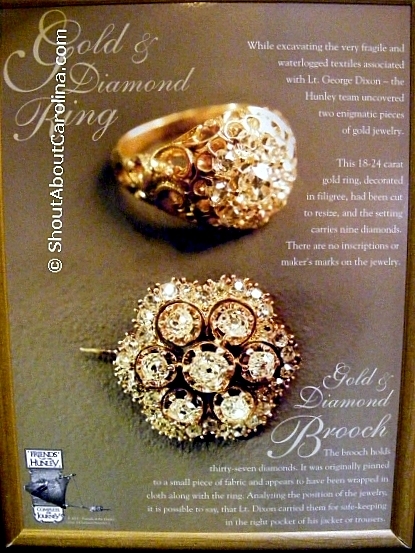 • A gold brooch with 37 small diamonds. Originally pinned to a small piece of fabric, it appears to have been wrapped in cloth along with the ring, most likely for safekeeping. The brooch featured a popular 1820s design symbolizing wealth and high status for its owner. It is believed the two pieces were made from different jewelers. Together they represented quite a fortune during Civil War. Why did Dixon carry such expensive jewelry with him in a perilous battle? Whom did they belong to? Were they also a lucky charm gift? 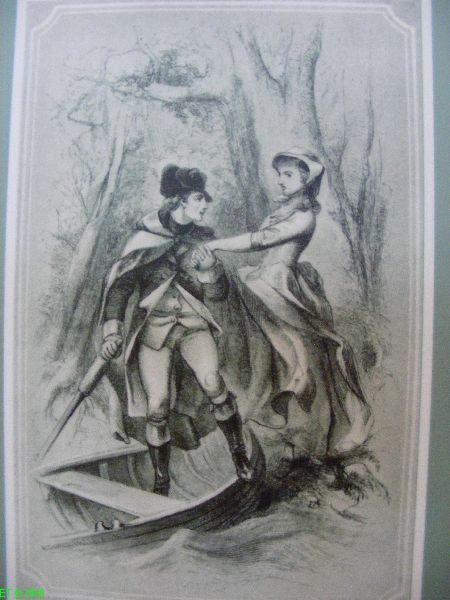 It was known that Lt. Dixon was a “ladies man”…. A Union soldier fighting with the Confederates on board Hunley?! On April 27, 2001, the excavation team was surprised to discover a Union ID tag inside one of the most secret Confederate naval weapon! The ID tag was found on the skull of one of the Hunley crewmen, bearing the name and class of Ezra Chamberlain, Private, 7th Connecticut Infantry, Union Forces. Was Ezra onboard that fateful night? Did he switch sides? Was he a prisoner and thus forced to operate the Hunley? Was Ezra’s ID tag picked up from the battlefield by a Hunley crewman as a souvenir of war? Mystery Solved! Early 2002, forensic experts found that the Hunley crewman wearing the tag was in his 30s, while Ezra would have been only 24 at the time of the mission. Further research suggests that Pvt. 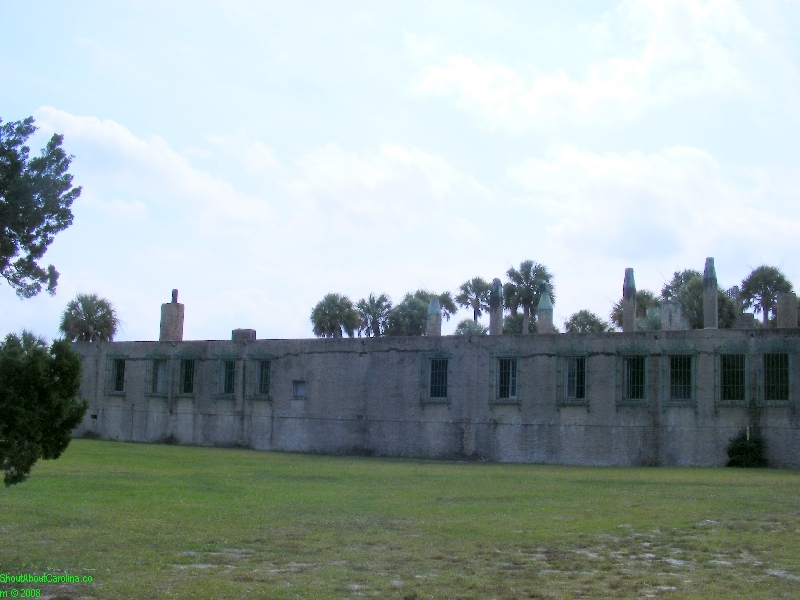 Chamberlain was killed in action 7 months earlier, during the Fort Wagner battle on Morris Island. The brass medallion was indeed a battlefield souvenir picked up by Joseph Ridgaway. 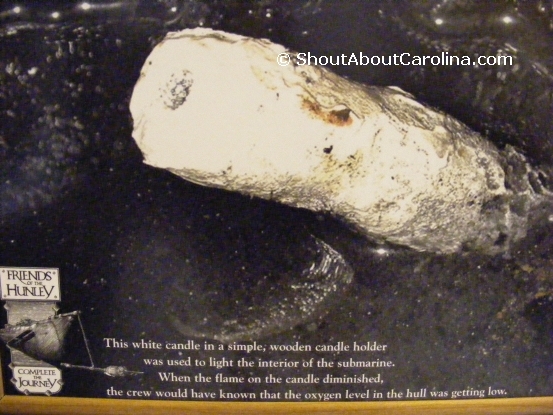 This simple white candle was used to light the interior of the submarine. When the flame of the candle diminished, the crew knew the oxygen level in the hull was getting low. Before the Hunley’s last mission, Lt. Dixon put the crew to rigorous training to test their physical and emotional endurance. On one occasion the men hat to wait at their stations for 2 and half hours, in complete darkness, while the submarine was resting on the ocean floor. This exercise proved extremely helpful during the mission since most of the navigation was done after the candle light blew off. 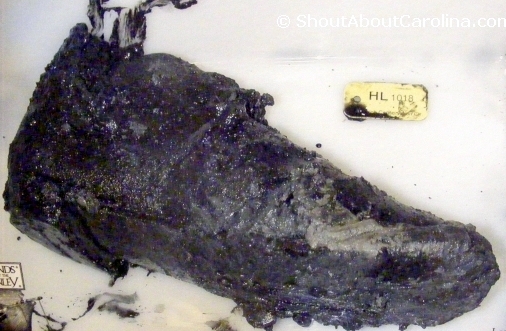 When found this leather shoe still had bones and tissue inside, more than 130 years after the submarine sinking! 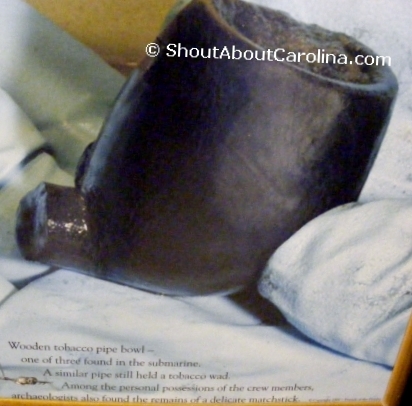 Three wooden tobacco pipe bowls were found inside the Hunley, with one still holding a tobacco wad! Among the personal possessions scientists also found the remains of a delicate matchstick. 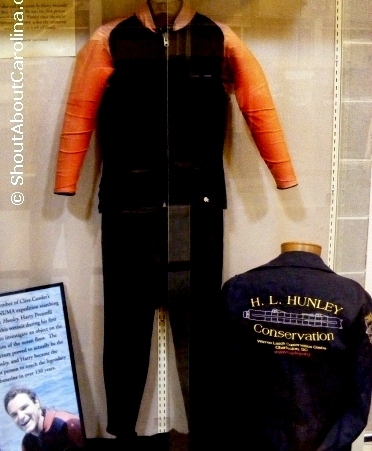 Harry Pecorelli, wore this wetsuit during his first dive to investigate an object on the ocean floor. The structure proved to be the Hunley, and Harri Pecorelli became the first person to touch the elusive submarine in more than 130 years! Check out this cool animation of the “2000 Raising of Hunley” provided on the museum official website. The human remains underwent comprehensive analysis by some of the world’s most noted forensic anthropologists. The results were remarkable showing the crew spatial distribution and the facial reconstruction of each member. 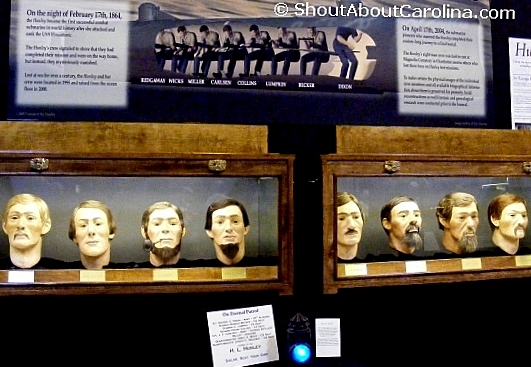 A biographical and physical portrait was assembled for each man who perished in the 1864 attack. 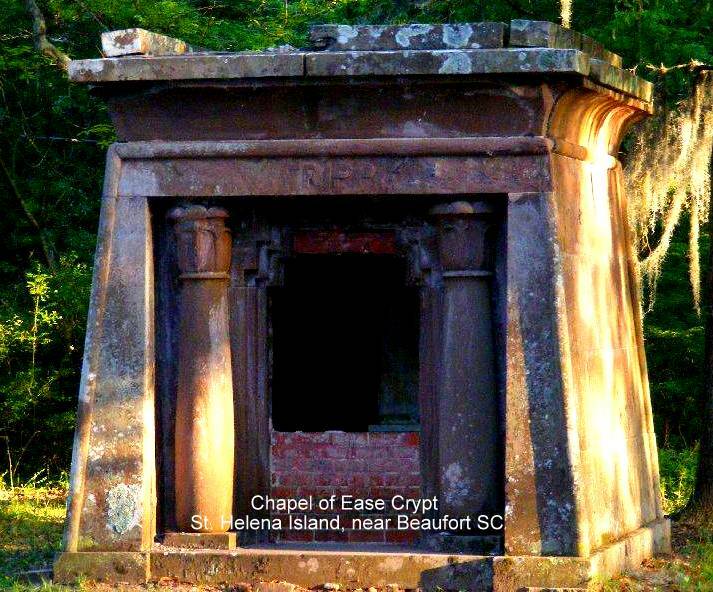 In 2004 the crew was buried with full military honors at Magnolia Cemetery in Charleston. They were laid to rest next to the two previous crews who also died while serving on HL Hunley. 2011 update! Hunley is sitting in an upright position almost 150 years after its sinking. 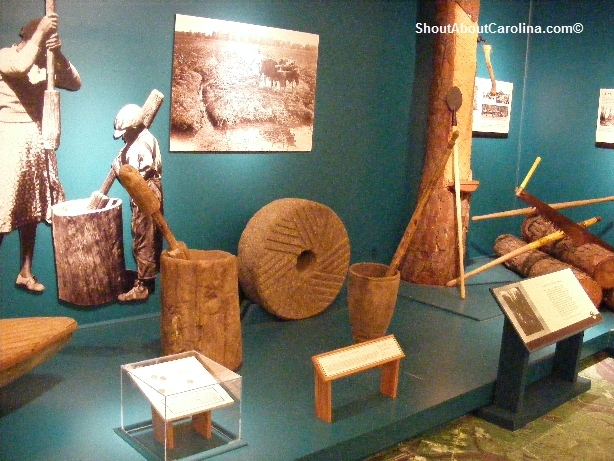 “Instead of looking like an artifact, it now looks like a stealth weapon,” said Sen. Glenn McConnell, chairman of the South Carolina Hunley Commission. The newly exposed side of the hull may finally reveal the answers needed in solving the century old mystery…”we are seeing some tantalizing clues on that side,” said Hunley lead archaeologist Maria Jacobsen. 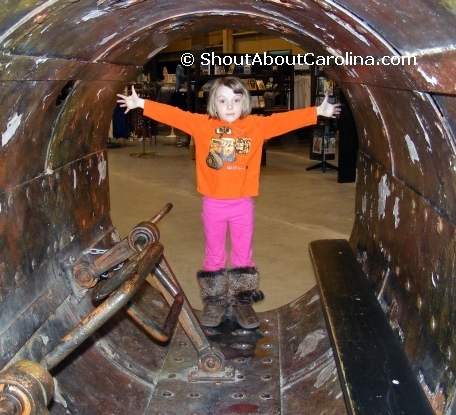 Relive the Civil War’s true “Mission Impossible” with the HL Hunley in Charleston! Arrrgh! Whatever happened to Queen’s Anne Revenge? 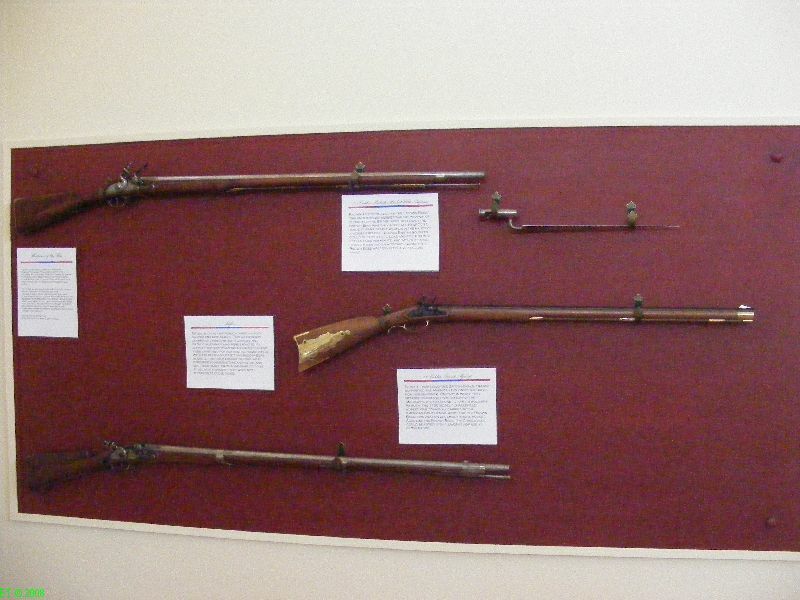 Wanna rub elbows with 18th century VIPs like Blackbeard, Captain Morgan and Edward Lowe? Well come down to Myrtle Beach Ripley’s Aquarium, a haunted house filled with odd sea creatures, outlaws and monster sharks! Welcome to the Pirates World at Ripley's Aquarium! Sea masters, privateers and just brilliant marketing pioneers…a world of mystery, wits and terror. 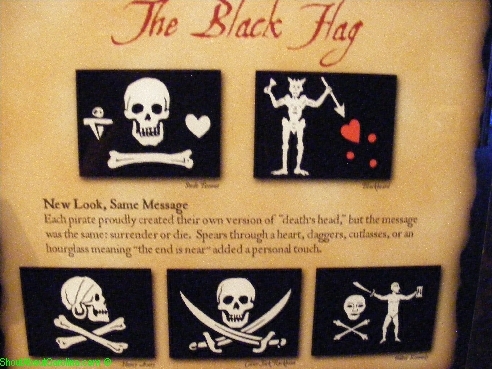 Most romanticized the pirates’ “rise against the machine”, others spited it for their ruthless and savage ways. Either way, the buccaneers stories were the first blockbusters fascinating the mankind to this day. 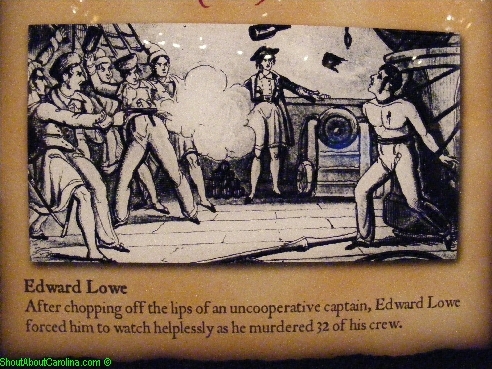 Legend has it Edward Lowe chopped off the lips of an opposing captain then forced him to watch his 32-crew being decimated before his eyes. Don’t blame it all on the pirates. Most of the tactics were taken from the Royal Navy training book. It was said that service in the Navy “was like life in prison, with the addition danger of drowning”! Do you have what it takes to be a buccaneer? 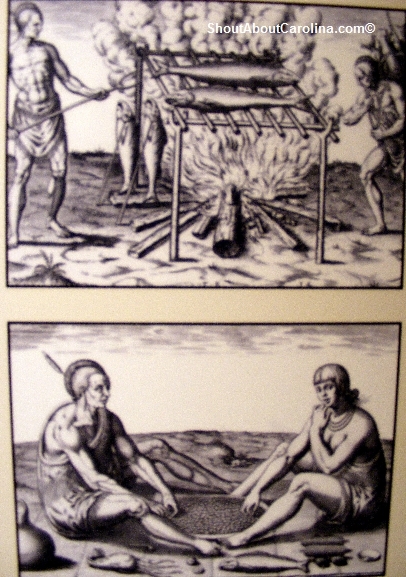 •	Cook – low culinary standards yet you’re expected to sew some skin! •	Surgeon – rarely on board, most likely the cook and carpenter played doctor! •	Master gunner – bomb baby bomb! •	Musician – well regarded to cheer up the crew. Runaway Design Show take notice! 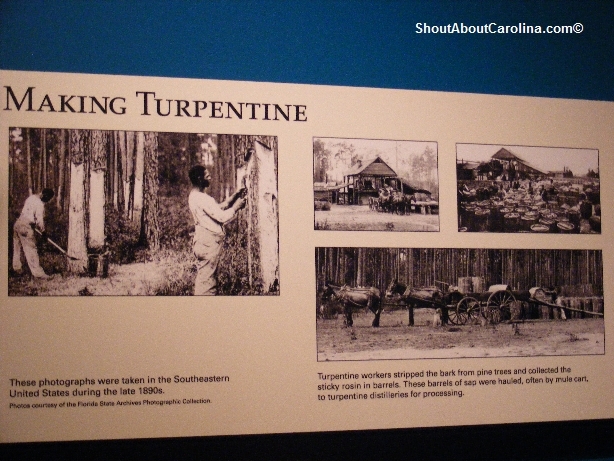 Here is a slideshow with more exhibit photos…just in case you need more convincing! There are group discounts and Ripley’s attractions combo tickets available. Call 1-800-734-8888 or visit their website for details. Ripley’s Aquarium is located inside Broadway at the Beach off of 29th North Avenue. 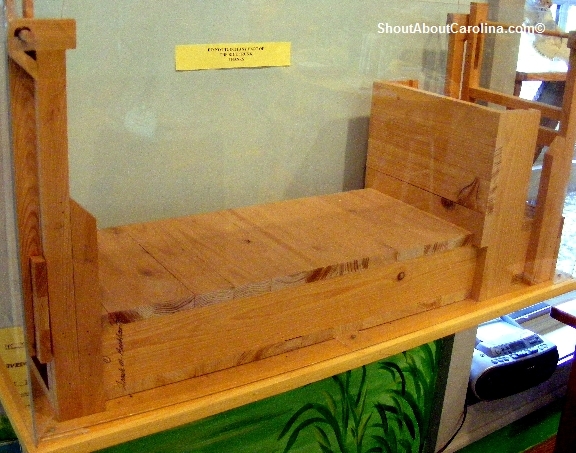 What else is fun for kids around Myrtle Beach for under $10? 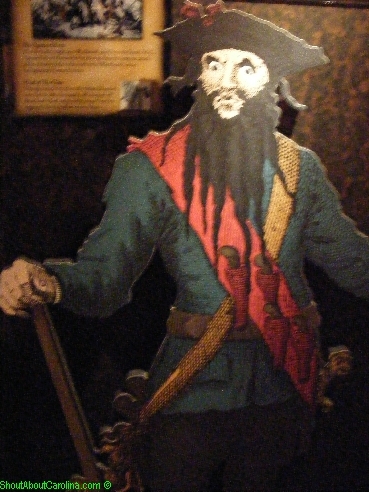 Blackbeard Ruthless Pirate of the Carribean! • The Gators are here…no really they are…at Huntington Beach State Park at least. ($5 adults, under 5 get in FREE). Art lovers, sculpture aficionados and nature enthusiasts watch out! 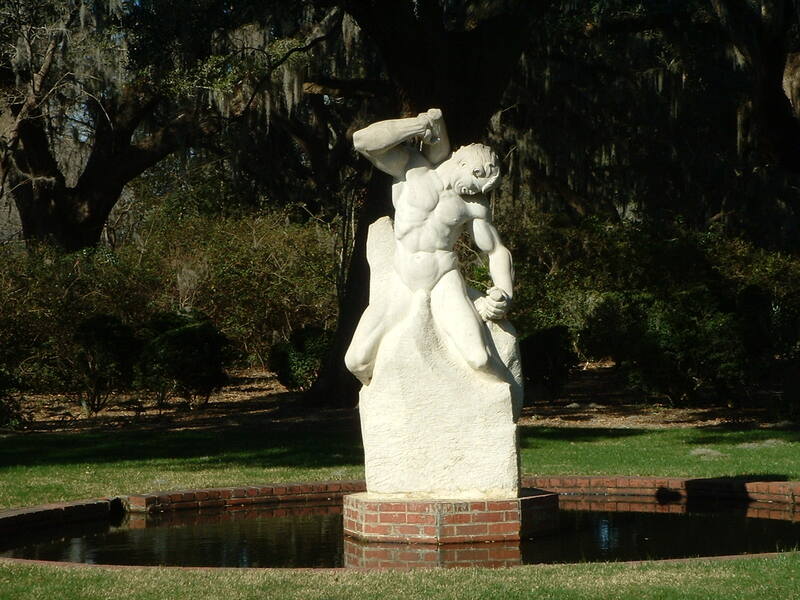 As you stroll Brookgreen Gardens’ peaceful trails showered by a rainbow of extravagant floral arrangements, as you admire one of the most magnificent outdoor sculptures collection in the country, it’s hard to imagine the pain and suffering soaked in these grounds. Yes, is slavery blood and all the misery that came along with it. 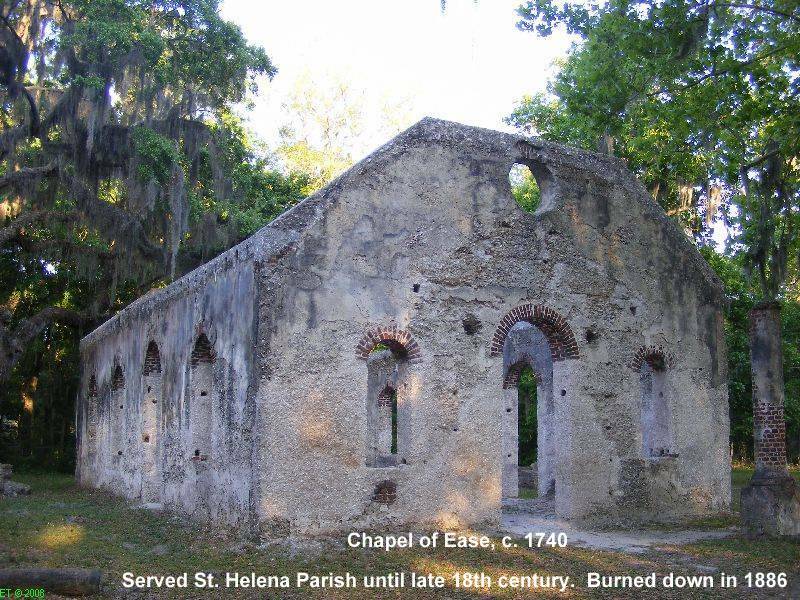 During the Civil War this land was part of the Brookgreen Plantation. Most of the time the owners were out traveling, leaving the business operations to Fraser the overseer. And Fraser “never failed to draw blood”. 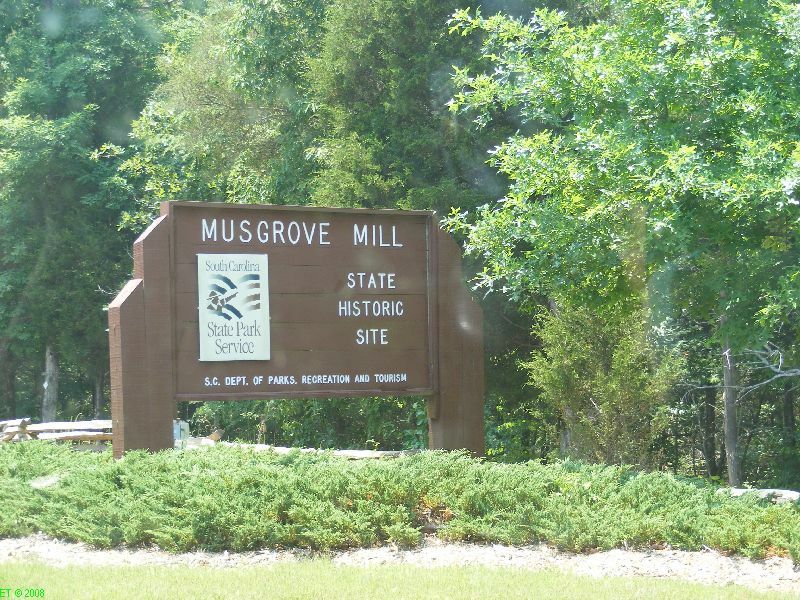 Once freedom came to Waccamaw River the people tried hunting Fraser down for payback. He was never found. Yet the blood stains in the barn were still there, a painful reminder of their ordeal. “We didn’t want to pass through the barn…We tried to get rid of them. Tried to wash them off. Wash! Scrub! Stains came back. We walked back and forth…Stomp! Stomp! Stains came back. Joe was one of them. He got a job as loading and removing sand but he failed miserably…wrecking the truck on the first day right in front of Mr. Huntington. He was fired on the spot. Few weeks later Anna Huntington needed a “scrawny horse” to carve the statue of Don Quixote. 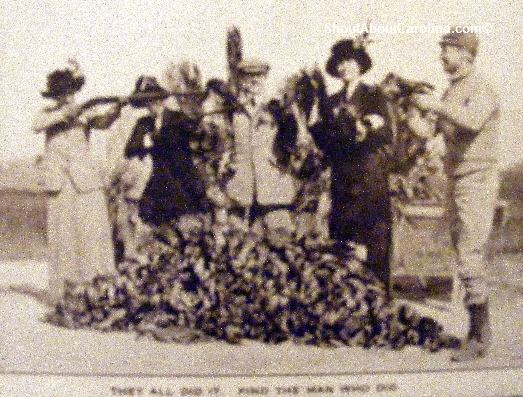 Joe found a “nag with bones showing through its rough coat and a head hung nearly to its knees”. Mrs. Huntington was delighted and she pledged to nurse the horse back to health. Joe volunteered for the task. Things looked much rosier with his employers. 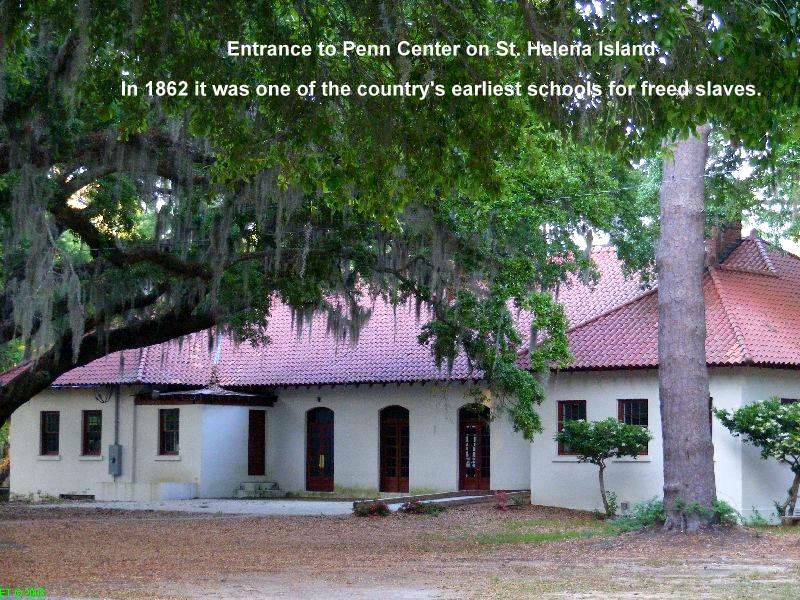 Come to Brookgreen Gardens and Atalaya at Huntington Beach State Park for a once in a lifetime inspirational vacation! 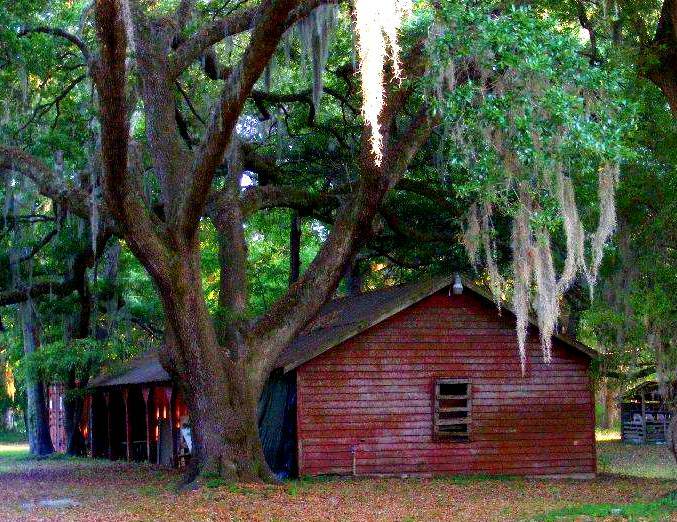 Disclaimer: All the quotes in this post are from Nancy Rhine’s riveting book “Tales of the South Carolina Lowcountry”, an engaging collection of folklore, ghost haunts, and real stories from remote Lowcountry lanes old-timers.